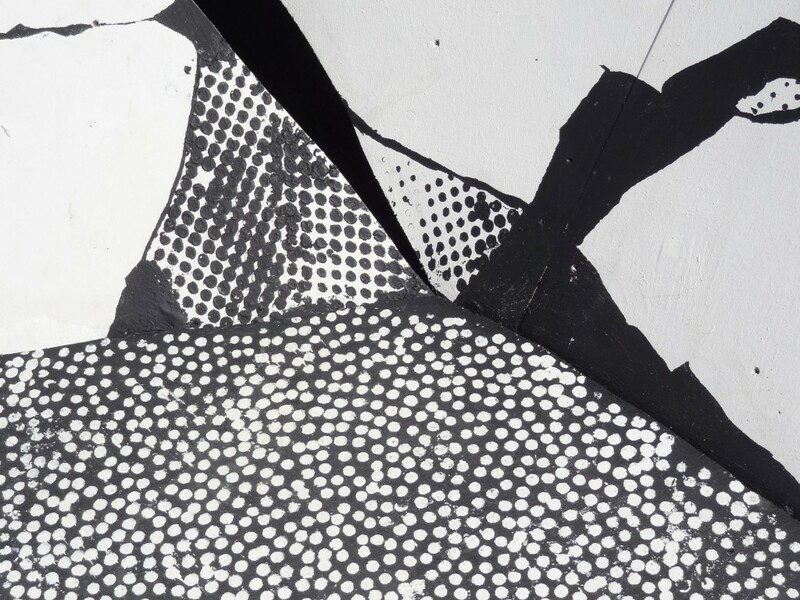 Through her latest public artwork, titled Suspect Terrain, Fasnacht details the creation and aftermath of a sinkhole. 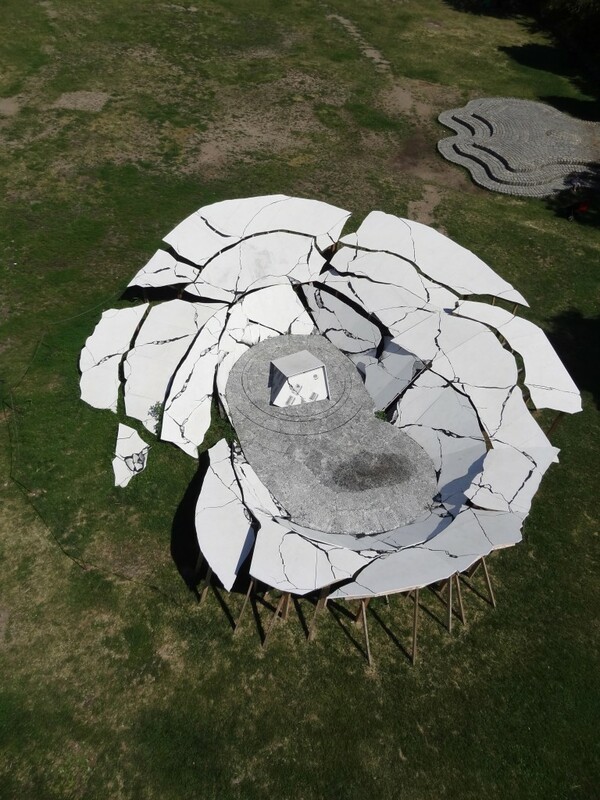 In Fasnacht’s vision, the particularities of fragmentation span 50-feet above ground and are detailed in painted plywood — a stand-in for the cement, asphalt, and rock substrate that the sculpture maps. 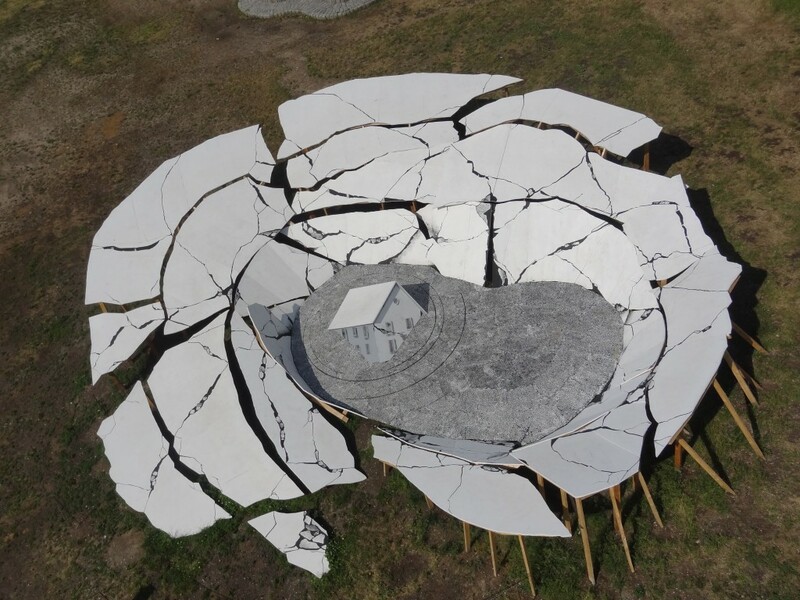 Fasnacht’s surface was inspired by striking media coverage and documentation of massive sinkholes, including the 26-foot-wide by 52-foot-deep 2013 pit created in the Shenzhen region of China and the 2010 occurrence in Guatemala City, Guatemala, that extended 60-feet-wide and approximately 30 stories deep. By sculpturally depicting these devastating geological occurrences, Fasnacht turns the relationship between event and documentation into a personal and precarious action. Since the late 1990’s Heide Fasnacht’s work has explored shifting states of matter, ranging from exploding buildings (pre 9/11) to damaged artworks in wartime, to the present iteration: the consequences of crater formation. For Fasnacht, destruction is the impetus for building. 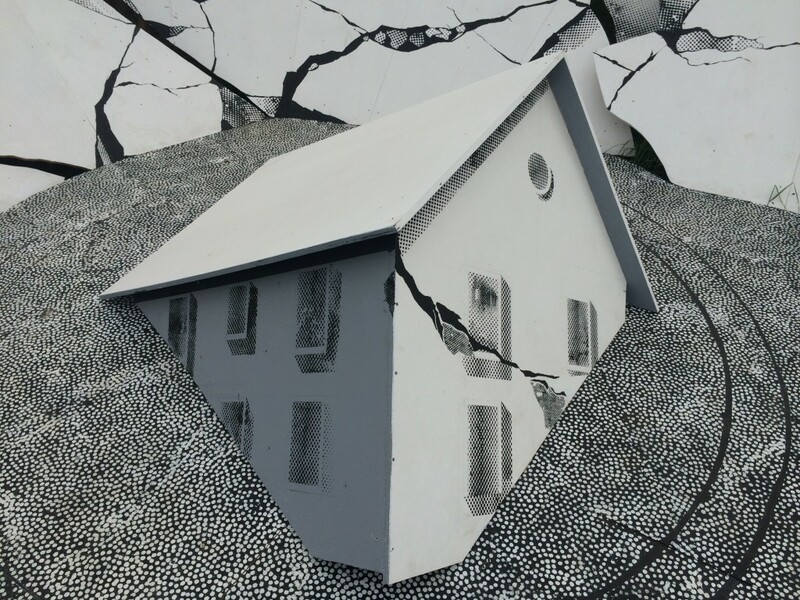 As the artist states, “I take the collapse as a plan to reconstruct in however fractured a fashion. These become objects of reflection on the instability we now all live with, on the flux of life, and the ability to create none-the-less.” Fasnacht’s title references John McPhee’s In Suspect Terrain (Farrar, Straus and Giroux; 1st edition, 1983), which offers a narrative of the earth through the geological lens of plate tectonics. 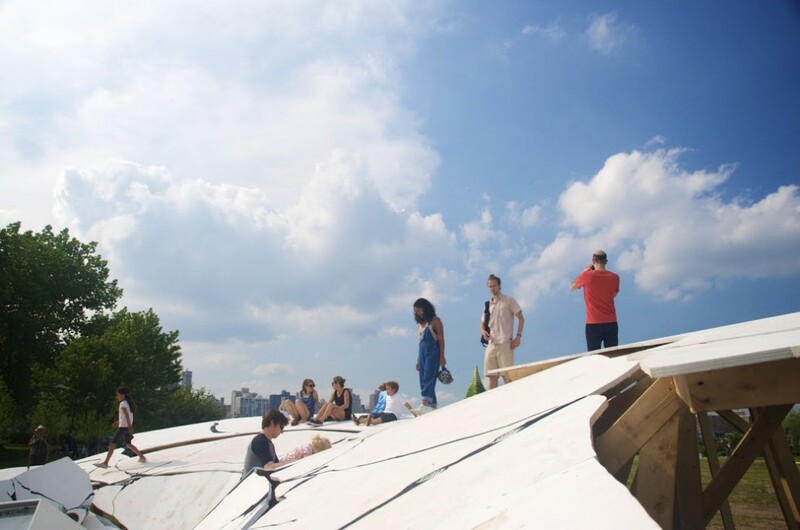 At Socrates Sculpture Park, the artist extends beyond the sinkhole’s composition to question assumptions about the built environment, including the park itself. At the bottom of Suspect Terrain lies a house half-submerged in a pool of illusionistic water, an allegory using the language of geological events that simultaneously explores the park’s unique history as an illegal dumpsite and landfill. Heide Fasnacht has shown an abiding interest in states of instability, uncertainty, damage, re-growth, and fracturing of materiality. These concepts have been explored through drawings, large-scale sculptures, photo-based work, and prints. Historical occurrences (wars & iconoclasm) and geological processes (earthquakes & explosions) show matter in action – shifting events. 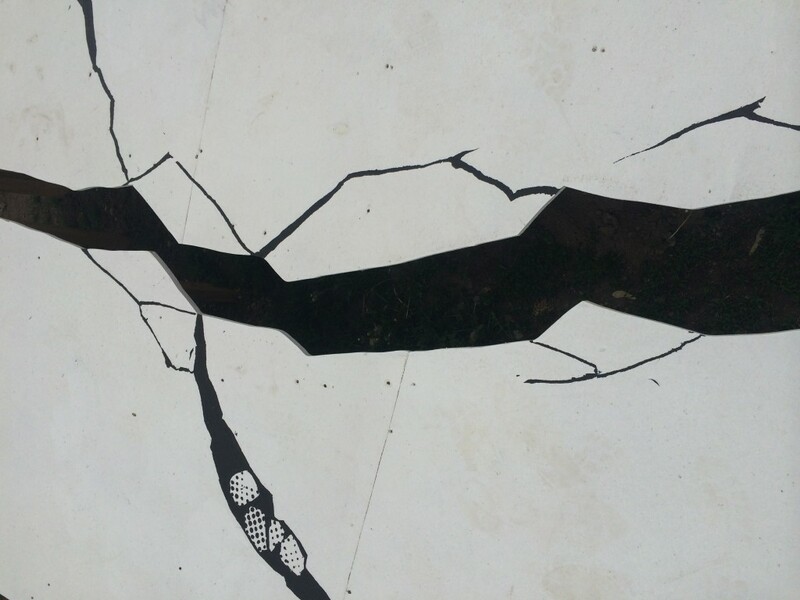 Deforming and reforming reveals fissures: damage and contortions on the landscape, in culture, in the built environment. Fasnacht’s process reflects these shifting events in both content and process. Her works have most recently been on view at Preview Berlin, Qbox Gallery and Art Athina in Athens Greece, Kent Gallery, Smack Mellon, and the American Academy of Arts & Letters in NYC. Since her first one-person show at P.S. 1 in 1979, Fasnacht has exhibited worldwide. She has been in exhibitions at MOMA, The Aldrich Museum for Contemporary Art, RAM Galerie, Rotterdam, Galeria Trama in Barcelona, The Worcester Art Museum and many others. She is in many permanent collections including: the MFA Boston, the Philadelphia Museum of Art, the Fogg Art Museum at Harvard University, The Walker Art Center and the Yale University Art Gallery. Fasnacht is also the recipient of numerous awards, including The Guggenheim Fellowship, several National Endowment for the Arts, New York Coundation for the Arts, The Gottlieb Foundation Grant, and two Pollock-Krasner Foundation Fellowships. She has taught at Harvard, Princeton, U Penn, UCLA, and others. Further visiting lectures include Yale, The Whitney Museum, RISD and VCU.